Dinner this week should be something warm and comforting, like soup, macaroni and cheese or chili, to keep us going through this lingering, wet cold front. We need the rain, certainly, but four days in the forecast seems too much. Of course, the pup doesn’t mind one bit, and we must still trudge through the neighborhood morning and night, with waterlogged shoes and hair that looks like it just came from the shower. If you’re looking for a stick-to-your-ribs kind of meal, this isn’t it. Because this pasta is instead light and healthy, and yet it’s still satisfying, invoking feelings of summer contentment and sunshiney happiness, even in the five minutes you may have to down a bowl before heading off to a meeting. A thin but flavorful sauce coats the angel hair, and is full of garlic-tomato-herb-cheesey goodness. For my produce-loaded countertop’s sake, this pasta makes good use of some of the cherry tomatoes I picked up last week, and best of all, it comes together in just about 15 minutes. This recipe comes from a May 2011 issue of Bon Appetit and is part of a “pasta cooking manifesto” proclaiming that “magnificent pasta starts in the saute pan, not a sauce pot.” Olive oil, garlic, and a vegetable or two combined with starchy pasta water form the sauce’s simple foundation, and letting the pasta finish cooking in the pan lets it absorb all the flavors and thicken. Finely grated cheese acts as a binder and lends additional texture and flavor to the sauce. A few notes of my own: Feel free to use whatever combination of herbs you have on hand, such as basil, parsley, oregano. I used a mix of all three last night. A scoop of ricotta, crumbled feta or a dollop of goat cheese are the perfect finish. 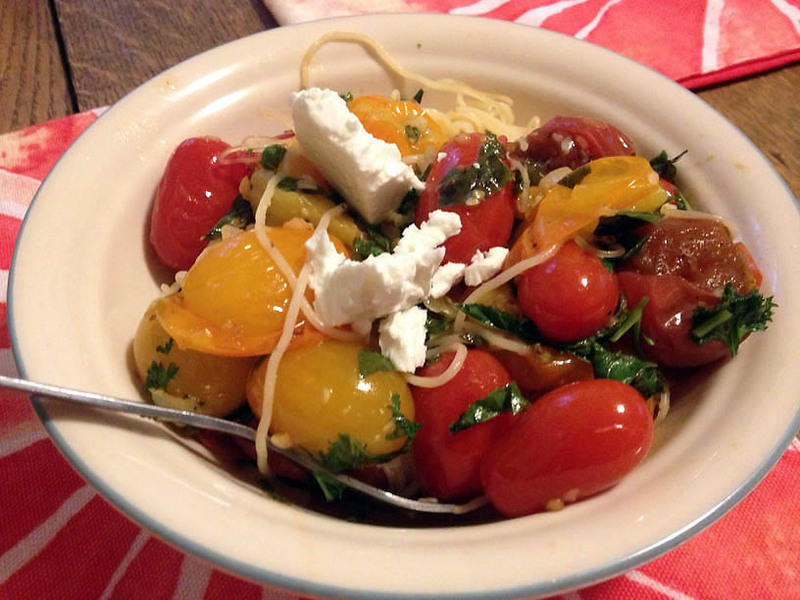 Don’t feel bound to the ingredient amounts–I often want a higher ratio of tomatoes to pasta. Adding chickpeas boosts the nutritional profile, as well. Heat 3 Tbsp. oil in a large skillet over medium heat. If using onion, saute it for a few minutes. 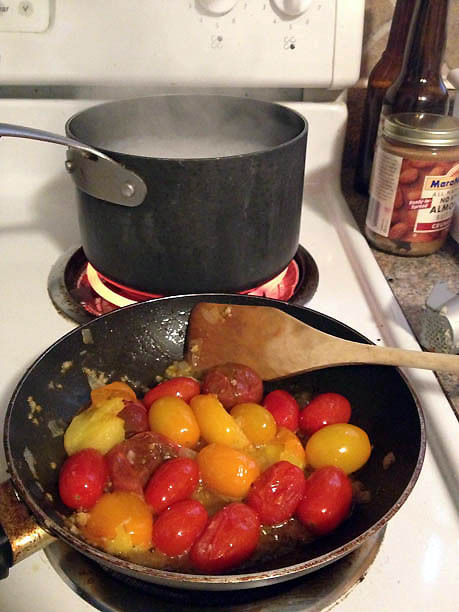 Add tomatoes, garlic, and red pepper flakes, season with salt, and cook, swirling pan or moving the tomatoes around often, until they blister and burst, 10-12 minutes. (Use higher heat if you’re in a rush and have to take a rainy dog walk before your meeting.) Press down on tomatoes to release their juices. 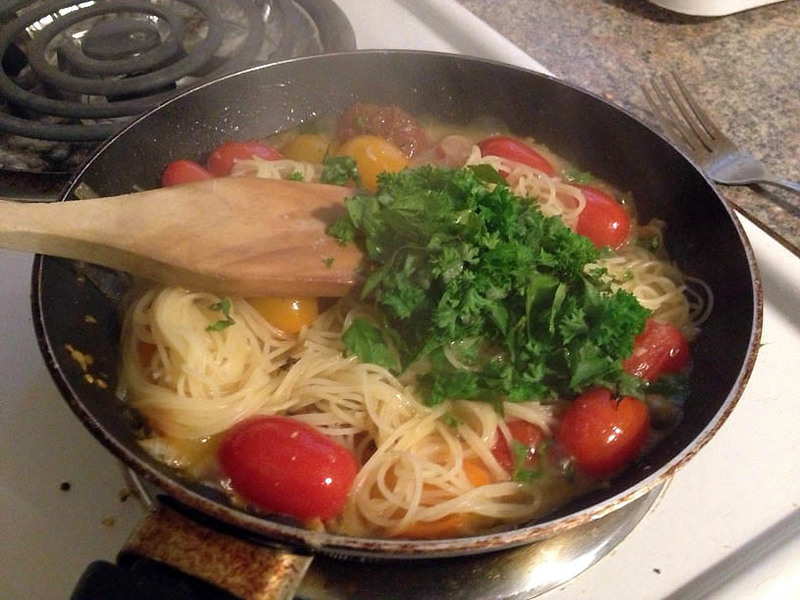 Transfer pasta to skillet with tomatoes, set over high heat. Add 1/2 cup pasta water. Cook, stirring and tossing with tongs often, until sauce thickens and begins to coat the pasta, about 1 minute. Stir in remaining oil or butter, cheese, and herbs and toss until sauce coats the pasta. Add more water if it seems dry. Season with salt and pepper. Serve with additional herbs and cheese.